We‘ve looked at the bountiful Laxmi, then the learned Saraswati and now let’s cast our eyes on the bold and beautiful Parvati-Daughter of the Mountains and the consort of Lord Shiva. In a way, Parvati is the ultimate Goddess. All Hindu women want to be like her and all Hindu men worship her. For she is none other than Shakti, the Cosmic Energy at play. Just as Shakti is experienced through her manifestations in Nature, so too is Parvati best understood through her various names and forms. The stories of Parvati form a big chunk of Hindu mythology. Their charm and their ability to inspire has endured over many millennia. Parvati is worshipped in countless different forms and names all across India from the tiniest villages to cities. Devotees will scale high mountains and go deep into dark forests to seek her. She is the Mother Goddess and from her being spring myriad other goddesses. I can’t possibly tell all her stories here in one post . Each one needs to be elaborated at length and relished slowly. I look forward to writing them in separate postings at a later stage. But here, just as an introduction, are brief sketches of her most popular and widely worshipped forms. Sati-Sati was the first wife of Shiva. His first love. She had married Shiva against her father’s wishes. One day hurt by her father’s insulting behaviour she immolated herself plunging Shiva into deep despair. Unable to bear her loss Shiva withdrew from the world into a cave. There he remained lost in meditation till Pravati came along and broke his trance. Parvati- Sati was reborn as Parvati, the daughter of Himavan-Lord of the Himalayas. Parvati means ‘daughter of the mountains’. Strong willed as the mountains she won Shiva’s heart through many years of severe penance and deep devotion. Gauri-Shiva and Parvati were married in a beautiful ceremony watched by everyone on heaven and earth and celebrated by gods and asuras alike. 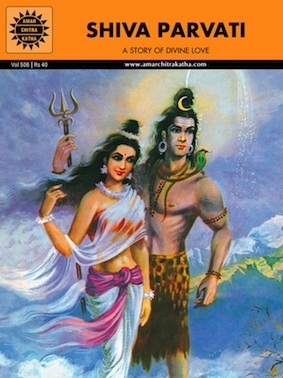 Parvati moved to Shiva’s abode in the Himalayas to live as his wife Gauri. Gauri awakened Shiva’s interest in the world by questioning him on various issues. As he spoke, Shiva revealed the secrets of the Tantras and the Vedas to Parvati. Shiva the foremost yogi then taught his wife yoga and through her passed on the teachings to mankind. Shiva enamoured by Parvati’s beauty sang and danced to the delight of the gods who named him Natraja, the Lord of Dance. Parvati is literally Shiva’s other half, fused to him in his half man half woman form of Ardhanareshwar. Shiva and Shakti – As the cosmic couple, they are worshipped together. While Shiva is Purusha, the latent masculine energy of the universe, Parvati is Prakruti, the vital feminine energy. The Ying and Yang of Hinduism. And, although they appear to be distinct they cannot be separated, just as one cannot separate heat from fire. Durga-Invoked by Brahma, Vishnu and Shiva to wage a war against the asuras and to kill the demon Mahishasur, Parvati becomes the powerful Durga. Riding a lion and wielding weapons, she single-handedly vanquishes the entire asura army and restores peace. Kali- To help her son kill the demon Raktabija, Parvati assumes the form of the dreaded goddess Kali. 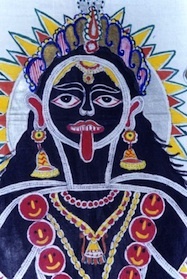 Dark as death, gaunt with sunken eyes, her enormous tongue hanging out, and with long disheveled hair covering her naked body, Kali strikes terror in the very heart of evil. Jagadamba –In this form Parvati is the guardian of the Universe. She is the Divine Mother who protects and nurtures her children, her devotees. Anyone who seeks her attention shall have it. Mother of Ganesha and Karitkeya-Parvati is also the mother of her two sons Ganesha and Kartikeya. One she fashioned from her own self and the other was born from Shiva’s seed but not her womb. She raised both with loving care and attention. 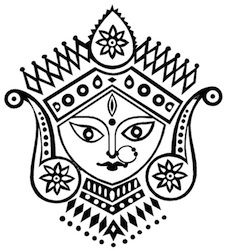 The Goddess is celebrated during Navratri all over India in different ways. For nine nights India revels in her power and energy. Gangaur is another major festival, dedicated to Gauri and is celebrated in Rajasthan for eighteen days, starting from the last day of Holi. Speaking of which, It’s Holi tomorrow. And it’s a whole other story which you can read about tomorrow !